The Crawford Fund’s Victoria State Committee is proud to have sponsored three scholars to attend this year’s annual conference on ‘Waste Not, Want Not: The Circular Economy to Food Security’. In addition, the support of the Gardiner Foundation and Marcus Oldham allowed for three more scholars to attend the 2016 conference. Click on the links below to view the scholar’s reports, which summarise their overall impressions of the conference. I continue to marvel at what an incredible, multi-faceted learning experience the 2016 Crawford Conference “Waste Not Want Not: The Circular Economy to Food Security”, provided. Firstly, I must mention the Crawford Scholar Program which transformed what might have been a very intimidating and overwhelming experience into something accessible, productive and hugely beneficial. Over the three days, our mentors helped us directly through introductions and handy tips, but even when they weren’t right by our sides, it brought great comfort to know they were nearby and willing to help! The second scholar day where we could speak with “seasoned” scientists was particularly helpful to me. It was reassuring to hear from people who had pursued numerous career paths throughout their time. It was also great to hear from the RAID members. When working in Laos last year I often wondered how I might continue similar projects whilst being based in Australia. I wasn’t sure if it would be feasible and it was helpful to discuss some of my concerns about these logistics with the relevant people. Another significant benefit of the scholar program was meeting the other scholars, who I found to be an impressive group of highly inspired and inspiring young people. Though most of us had very diverse and specific interests, we were all united under the general themes of food security, sustainable agriculture and food waste, and tended to have a lot to talk about. I have the contact details of many of the other scholars, and have been keeping actively in contact with a few who attend my university. In terms of the conference itself, I think the highlights and benefits could be bundled as those that relate directly to my current work in plant pathology, and then those that arose from listening to and speaking with people, who like my fellow scholars, had very different focuses to my own, but similar ideals and ideas about sustainable agriculture. One of the major and slightly unexpected highlights of the conference was meeting quite a few plant pathologists from around Australia. I was naively unaware there would be so many people at the conference with interests so closely aligned to my own! Since the conference, I have been in dialogue with three new plant pathology colleagues from Adelaide and Queensland regarding my current work. I have hopes that these will be long-lasting relationships. All of the talks given during the conference were informative and interesting but some were particularly outstanding to me. In terms of my own work, the talk by Washington Otieno was most pertinent. Washington is the Plantwise Programme Executive at CABI and he spoke about a plant pest and disease diagnostic tool which is in use in many developing countries in Africa. This sounds like a fantastic tool which I am keen to explore and possibly introduce as an idea to the plant disease diagnostic laboratory in southern Laos where I worked last year. I also found the speeches by Louise Fresco on the scholar day regarding her own career path, Cedric Simon about alternative sources of fish feed and Bernadette McCabe about waste-to-energy technologies to be particularly memorable. So thank you, Crawford Fund, for providing me with the opportunity to attend your 2016 conference. I’ve come away with a new grasp of the full breadth and depth of the food waste issue. I’ve also experienced a boost in my inspiration and energy levels to continue working in this important field. With one billion currently malnourished people in the world and a third of food produced never reaching our plate, halving the amount of food lost from paddock to fork has the potential to meet our global demands. The major contributors to waste differ between the developing, transitional and developed worlds. Food waste very early on in the supply chain is significantly more prevalent in low-income countries. This is in contrast to developed countries where the losses are much higher, later on at the commercial end point. The conference speakers informed us about food loss on the farm, waste along supply chains and at the consumer endpoint. Experts on the management and reuse of waste enlightened us on the strategies that can make food production more sustainable. Professor Louise Fresco presented a thought provoking Sir John Crawford Memorial Address, which outlined the causes of food waste and the role that institutions, private sectors, governments and individuals can play in order to achieve less waste and better sustainability. While it is crucial to address food waste at the farm gate, specifically in developing countries, it was interesting to see the mitigation strategies that wealthier countries such as our own can adopt. I really enjoyed how sessions introduced an overview of the type of food loss, which was then followed by relevant case studies, which put all of the research into perspective. I particularly enjoyed Mr Simon Costa’s case study, which presented a very hands-on approach for minimising on-farm food loss. Nutrient reuse is something that before the conference I had never really heard of. Dr Dana Cordell spoke about some fascinating solutions including the reuse of phosphorus from human excreta. Dr Washington Otieno, executive of the Plantwise programme at CABI explained how they provide “plant doctors” to small holder farmers to reduce crop losses and prevent further spread of disease. As a university student, attending the annual Crawford Fund 2016 conference “Waste Not, Want Not: The Circular Economy to Food Security” was an amazing opportunity. It was wonderful discussing food security with likeminded peers and experts. Hearing from renowned scientists such as Louise Fresco about their journey and first hand advice was invaluable. After returning from the conference, I’ve realised the numerous possibilities available in terms of international research. The individuals from RAID informed us about every aspect of overseas travel for research. It is really reassuring to know that there are organisations that are so willing to support you in these endeavours. I am truly grateful to the Crawford Fund for giving me the opportunity to attend the conference and to be a part of scholar program. The contacts and knowledge that I gained, along with a passion to tackle food security challenges from this unique opportunity has been incredible. Attending the 2016 Crawford Fund Conference was an amazing experience. The Crawford Fund have created an engaging Scholars program that adds incredible value to the conference experience for young professionals. On the first scholars’ day I was able to start making connections and practicing important networking skills in a supportive environment. By the next day, I felt a lot more prepared for the conference and confident in my ability to network with a huge range of people. I believe the connections I made throughout my time in Canberra will prove to be hugely valuable in the coming months and possibly years. Sometimes established professionals underestimate some basic skills that a conference experience can teach. Simple things like how to dress professionally, how to approach people respectfully, what kind of questions to ask and how to best communicate your own work, project or interests. All of these things might come naturally to a seasoned professional, but these are all new skills for university students. Thanks to this amazing opportunity, the next time I attend a conference or a professional event, I will be even more prepared and even more successful in meeting the right people and having productive conversations. Thanks to the many fascinating conversations I had and presentations I watched, I feel a renewed excitement for my future and the range of work available to me. Since returning home, I’ve reached out to many of my mentors for their advice about my potential career path opportunities. I feel motivated to really think about what it is that I want to do after I finish my Masters studies and therefore what subjects I should do now to best prepare myself. The two evening events, on Monday and Tuesday night, were absolute highlights for me. They gave me time to connect with my peers from all across the country and people already in the industry. I believe that’s the real value of conferences; to be challenged and inspired by the speakers, but then to really engage in debate about those topics with your peers. An unexpected highlight was the friendships I formed with two students from my university who I didn’t previously know. We decided to meet up before the conference and then touched base with each other throughout the conference. It was great to always have someone to catch up with or to encourage you to pursue a particular conversation. Since the conference we’ve met up multiple times at food and agriculture events, and I hope this is the start of a long friendship with two wonderful people with similar interests and ambitions. I am incredibly grateful for the opportunity to attend the 2016 Crawford Fund Conference and scholar program. This experience has already influenced my own attitude and focus for my future, and I believe the connections I made will be very valuable in the future. Thank you to everyone who helped make the conference and scholar program happen, and thank you to those involved in the selection process that allowed me to attend. 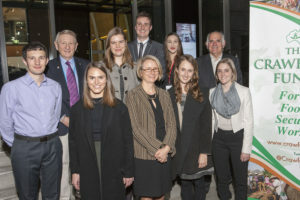 Recently I was fortunate enough to be one of the young, agriculture-minded scientists to be invited to the Crawford Fund’s Annual Conference for 2016 “WASTE NOT, WANT NOT: The Circular Economy to Food Security” in Canberra. This year, the focus was on food loss and food waste, two different, albeit intertwined aspects of improving food security and the agriculture sector as a whole. With my background in Veterinary Medicine it was a different perspective on the agriculture industry and highlighted to me how continuing to improve agriculture, particularly in developing countries, is crucial to ensure sustainability with continuous population growth. Dr Karen Brooks’ speech highlighted to me that a significant amount of loss is happening in developed countries, including in my own fridge, and forced me to consider my own consumption. It was quite interesting for me to hear high waste of food is occurring in countries where hunger is not necessarily as high, which highlighted to me the importance of the leading nations, including ourselves in Australia, to continue to improve our own management, not just working on storage in developing countries. Dr Brooks summed up eloquently where the industries need to improve depending on the region with this quote: “The most food waste and loss is “near the fork” in developed regions and “near the farm” in developing regions”. Contrastingly, it was refreshing to hear from Simon Costa, a member of the UN World Food Project. Mr Costa looked at the research, found an area lacking in analysis—ineffective post-harvest handling—and attempted to rectify it. Some of the results were astounding, with a switch from focusing on crop productivity, to focusing on preservation and storage of food resulting in reduction in food loss by 98% and increasing income of farmers by 100%. Mr Costa was passionate, but was not afraid to express his opinions on various areas. The presentations as a whole highlighted to me the importance of continuous research, but as mentioned the research needs to be utilised, as done by Mr Costa. The scholar activities were excellent, providing some time to get to meet fellow young people interested in agriculture. Coming from Melbourne University, which has a large majority of my cohort desiring to enter Small Animal Practice, it was refreshing to talk to people who were passionate, interested and knowledgeable about agriculture. Furthermore, the opportunity the mentoring program provided me with ensured I got to talk to people in various fields, but also highlighted that while I may want to work in Large Animal practice now, possibly I may enter research in the future as my career unfolds. My ambition has always been to run and operate a large animal practice, however going to a conference which was heavily research based highlighted other opportunities for me which I hadn’t considered. I was fortunate enough to meet people who are doing research in the Dairy Industry, something I’m very passionate about, reaffirming to me that clinical work isn’t the only option for a veterinarian. It has made me consider other options, particularly in focusing on ruminant research in improving disease resistance. I was lucky enough to be put in touch with some people from ILRI with the desire to do some international research in the future. One thing I would like to see improved or considered is more mention of the livestock industry, a crucial component of the agriculture sector. Professor Louise Fresco discussed that meat is crucial and irremovable from the industry, however, nobody mentioned the significant losses caused by poor animal health, nutrition or disease prevention. Ultimately, the Crawford Fund Conference was a great experience and reaffirmed to me my desire to work in the agriculture sector. I had a thought-provoking and inspiring couple of days as a scholar at the Crawford Fund’s Annual Conference on food security which I had the honour of attending as a scholar funded by the Gardiner Foundation. Previously I was aware of the Crawford Fund’s activities but had mistakenly assumed their annual conference was only open to people working or studying in international agriculture. I’m truly glad this assumption proved incorrect and relished the opportunity to network with a diverse group of researchers during the conference. The focus of the conference was inefficiencies in the food supply pipeline. Hearing Prof Louise Fresco give the Sir John Crawford Memorial Address, “The Future of Our Food”, was the highlight for me. As well as delivering a thought provoking address, I was inspired by the way that Prof Fresco communicated her messages. Two other presentations which really resonated with me were those given by Dr Karen Brooks and Prof Alice Woodhead. Dr Brooks’ picture of her fridge in her morning keynote address prompted many, including me, to think about our own food wastage. Prof Woodhead’s presentation on food wastage in mega cities really made me ponder how increasing urbanisation is contributing to food waste. It also made me consider my own experience moving from regional NSW to Melbourne. When I lived in NSW, food scraps went to the dog, chooks or pigs with the remainder composted, but in Melbourne it’s going straight in the bin. My housemates and I have resolved to find a solution to this despite having no backyard and are looking into worm farms and community garden compost schemes. The Crawford Fund is not alone in offering financial assistance to early career researchers to attend scientific conferences. What sets them apart is the other opportunities they provide their scholars. I remember all too well how daunting my first ever conference was so the ½ day scholars program held immediately before the conference was a great opportunity to meet other scholars in a more intimate setting as well as meeting our assigned mentors. The conference is just the beginning for me and my mentor, with an invitation extended to catch-up next time I’m in Queensland and keep in touch via email. Being surrounded by so many young people who share my passion for agriculture was an energising experience. There was a real buzz in the room over the three days and learning about everyone’s diverse backgrounds was fascinating. I also appreciated the openness of the final scholars’ discussion where difficult subjects like balancing a research career with family were raised. Being a Crawford Fund Scholar provided a wonderful opportunity to meet and hear from a diverse group of people passionate about agriculture and food security, reminded me of the importance of collaborative research projects and reinforced my desire to make a meaningful contribution to agriculture’s future. Personally I have also been challenged to consider what I can do to reduce food wastage. Thank you to the Crawford Fund and the Gardiner Foundation for the opportunity to attend the 2016 Crawford Fund Conference. It was a great honour to be invited to this year’s conference as a scholar. Admittedly, the invitation to apply was the first time I had heard about the Fund and the yearly event but I am very glad that I took the chance and applied to attend—I would not have the opportunities that I do now. Professor Louise Fresco, President of Wageningen University, was the keynote speaker for the Sir John Crawford Memorial Address. Speaking about the fact that agriculture was the most important thing that human beings could do, she highlighted that despite having an abundance of food available to the population, the majority of people are unaware of how food goes from farm to fork. Since the conference, I have had several interesting email conversations with Louise, expressing and developing ideas. She has also put me in touch with leading economists who have provided me with the latest agri-economic research papers. Ashok Gulati described a particularly shocking fact—1.3 billion tonnes of human grade food is wasted each year and if one quarter of that was saved it could feed 870 million people. Suggesting innovation in agriculture, he raised a few laughs by describing Uber tractors for developing countries. This raised concerns from the audience and following discussion groups about biosecurity although it was stated that in many small nations, pest and disease issues were already widespread. Ashok reiterated a common theme from the conference that often food production is not the major issue concerning waste—it is the transportation and logistics that cause the most loss. Personally, one of the major highlights from the conference day was the discussion topic from Simon Costa, former CEO of the Costa Group. He spoke about the link between food loss and poverty, and that without a reliable food source people cannot work and gain a better life. His work in Uganda helping farmers to reduce grain losses by introducing simple and inexpensive methods to store product has helped over 16, 000 families to reduce wastage by up to 90%, providing 97% of the participants with direct financial gain. Simon stated that 95% of all research investments over the past 30 years have focussed on increasing productivity with only 5% going to reducing food loss. This was one of the statements that has stayed in my mind. After the conference ended I contacted Simon and shared ideas and asked him to stay in touch as another mentor. I hope that I will be able to help the Fund and Marcus Oldham develop a working relationship to promote further scholars so that they can have as many opportunities as I now have. If you get the chance to apply, don’t hesitate! Finally, I would like to take this opportunity to say thank you to all of the people who made my attendance at the conference possible and so enjoyable: Dr Julie Nicol who first approached Simon Livingstone and Yasmin Chalmers at Marcus Oldham with the proposal of sending a scholar to the conference; Cathy Reade and Melina Gillespie for their support before and during the event; Tony Fischer and Neil Inall for spending time with me during the scholar days; and Tony Gregson, my mentor for introducing me to so many industry leaders I lost count!